The new App Build Template in Purple DS Manager offers many small improvements to optimize the loading behaviour of app content. This way, your app users have even faster access to all articles. Here we have summarized the most important updates of the Purple DS Suite. Please also note that in the future, all content in the web newsstand will only be played out via a secure HTTPS connection. Please make sure that all external web resources (images, fonts, videos, websites) delivered by a domain other than purplemanager.com are integrated into the content via HTTPS. To activate these new features, please ensure you use the most recent App Build Template “Standard 3.9” in the Purple DS® Manager. In addition, we would like to point out important changes regarding the future support of older app build templates, about possible complications regarding an update to High Sierra as well as the necessary steps to further receive the release notes. Keep creating your DIGITAL JOURNEY with us! Now any utf8 sign is allowed for app name. In the future, all content in the WebKiosk will be played out via a secure HTTPS connection. It is technically necessary that all external web resources are also integrated using HTTPS. Please make sure that all external web resources (images, fonts, videos, websites) delivered by a domain other than purplemanager.com are integrated into the content via HTTPS. If you have any questions or need support, please contact our Customer Care Team. The updates of Android and iOS operating systems require relevant adaptations for many apps and features. In order to provide you with the best customer service at all times and to ensure that your apps meet the latest standards and work on all common mobile devices, we are bundling our strengths and are investing more in development. Accordingly, we will only guarantee latest innovations for the latest App Build Templates from now on. In concrete terms, this means that we will only implement and test App Build Template 3.8 and higher with regards to new features. We therefore recommend that you always use the latest App Build Template. This ensures that all features work smoothly on all mobile devices. We officially say goodbye to the ipad 2. With the new release we will only support iOS-based devices running on iOS 10 and higher. Please get in touch with us if you have further questions. SPRYLAB is currently advising against an update to the operating system version High Sierra, which was released by Apple on September 25th, in analogy to other renowned software providers such as Adobe or Steinberg. With the currently not yet stable version of the operating system, there may be functional restrictions in connection with High Sierra for products such as the Purple DS Composer. SPRYLAB will inform you of official support for High Sierra as soon as a stable version has been released by Apple. 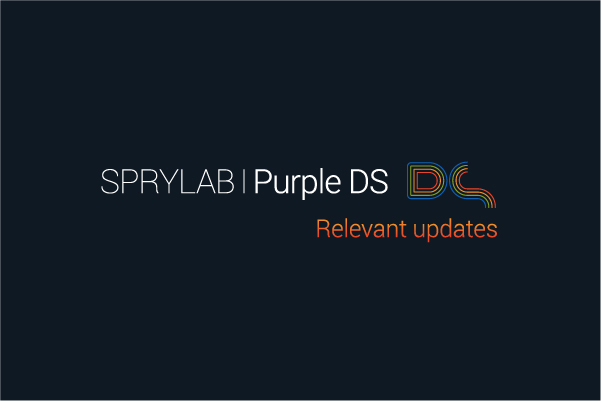 Please confirm your interest in our Purple DS release notes by visiting the link below and confirming your email. Just like everyone else, we are preparing our processes and services to adhere to the new data protection regulations. We will be ready in time and will soon be back to give you more detailed information on anything you need to know in case you are a Purple DS customer.